We are a one-income home. When we first got married, my husband and I agreed he would financially support our family so I could stay home to raise our future children. If I made any money, it would go toward extras like vacations and big-ticket items. While I've had the occasional part-time job, I've maintained my role as a stay-at-home mom for the last fourteen years. Two months ago, we moved into our dream house. Yet, besides our camping trailer (which can be sold in an emergency), our mortgage is our only debt. Do you want to know how we did it? Do ya? Do ya? Last week, we talked about creating a budget. Did you take the time to create your own? And did you stare at it, running your hands through your hair and wondering how in the world you were going to stick to it? Two words - savvy spending. In others words, being smart about how you use your money. Let's start with a few basics. 1. Use a cash-based system. Have you heard of the envelope method? Pull cash out of your bank account to cover all your spending for the pay period and divide it into envelopes. Each envelope is labeled with the money's purpose - groceries, clothing, recreational, and so on. When the money is gone, it's gone. No credit cards, no debit cards, no checks, no more spending. We've been using this for our groceries for a while now and it really works. I'm more careful with how much I spend. Any money left over at the end of the pay period is mine for any discretionary spending I want to do. 2. Minimize your trips to the store. Every time I go to the store, I end up getting more than what's on my list. 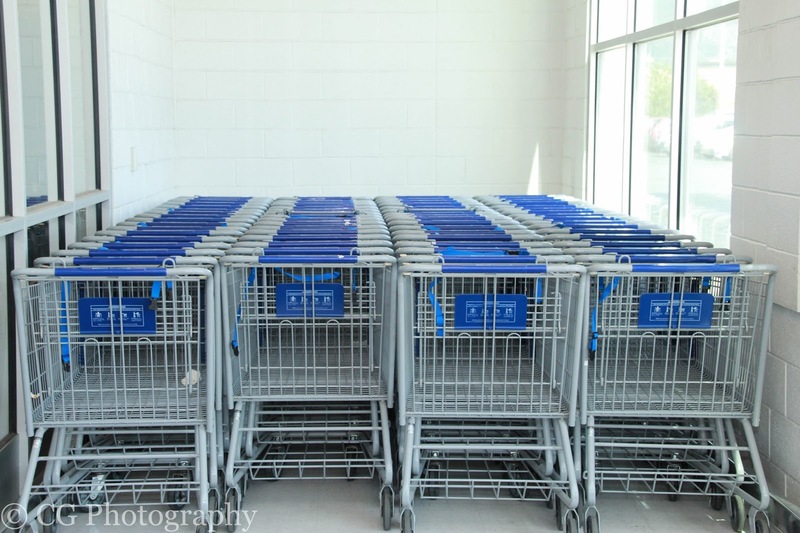 While one or two extra items doesn't seem like a lot, it adds up quickly. Let's say I'm spending an extra $5.00 each time I go through the checkout line. If I go to the store just once a week, that's not too bad. But if I'm there five times in the same week, that's an extra $25.00 I'm spending. 3. Stick to your list. I'm not just talking groceries here. Food, clothing, school supplies, books, crafts, auto parts... Every time you go to the store, have a list and stick to it. Eliminate as many impulse purchases as possible. If you see something you just have to have, put it on a wish list and let yourself think about it for a few days. You may decide you don't really need it after all. 4. "Shop" at home before you go to the store. Take an inventory of what you already have before you pull out your wallet. Dig through your pantry, unearth the clothes in your closet you haven't worn in ages, open boxes from your last move three years ago. Case in point - I was putting together a capsule wardrobe for warm weather and determined I needed a pair of cute sandals to complete a look. On a whim, I threw on a pair of sandals I had previously determined were going to be donated since I hadn't worn them in years. A crazy thing happened - I fell in love with them again. And saved myself the cost of new ones. Simple enough. But guess what? There's more! The rest of the list is divided into categories to make it easy on me, I mean, you. Yeah, you. 5. Take advantage of coupons and sales. Especially together! I'm not necessarily talking about extreme couponing, but combining sales and coupons can really add up. Let's say a box of cereal, normally $4.00, goes on sale for $3.00 and you have a coupon for $1.00 off. How much do you save? Fifty percent! Check out www.thekrazycouponlady.com, www.retailmenot.com, www.coupons.com, or my personal favorite www.couponmom.com for more info and couponing resources. 6. Compare prices between store brand and name brand items. There are some items I buy the brand name every time - toilet paper, butter spread, deodorant - but for everything else, I go for what's cheapest. WinCo is one of my favorite stores because nearly every week, I can find select name brand items for less than the store brand. When the brand name is cheaper, I stock up. If not, I go for the store brand. 8. Go homegrown. Grow a garden, go to a farmer's market, join a co-op like Bountiful Baskets, swap fruits and vegetables with neighbors. Can, freeze, or dry what you can't eat before it spoils. 9. Hit the sales and clearance racks first. Some of my favorite articles of clothing came from the clearance rack at department stores. 10. Shop at second hand stores. It's amazing what you can find. My teenage son is hard on jeans, so I have a hard time coughing up $20 or more per pair when I know they're going to be sporting holey knees within weeks. 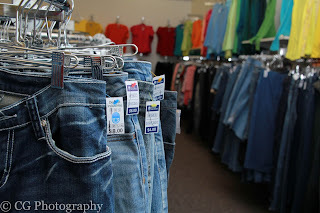 The last time I took him to a thrift store for jeans, we came away with four pair for just $30. One pair still had the original tag from Old Navy on it! 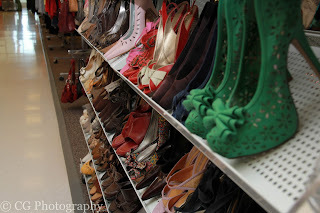 Many thrift stores, like Deseret Industries, use the proceeds from their sales to help those who are less fortunate. Double win! 11. Mend or alter to make it work. If you can sew a straight line, with a machine or by hand, you can hem a pair of pants. Or take in a shirt. Or change those bell bottoms you thought were so cool back in the nineties (or decades earlier than that) into skinny jeans. If you're not sure how to do it, YouTube and Pinterest are excellent resources for tutorials. 12. Go free or cheap. A picnic at the park, an afternoon at a neighborhood splash pad, running through the sprinklers, a trip to the library for storytime, a hike through the woods, free day at the zoo. Make a summer bucket list with all these and more. Then do it all. 13. Online deals. Groupon has amazing deals if you're paying attention. In my area, our local news station has KSL Deals, which works just like Groupon, but everything is local. We often attend events for a fraction of the cost. Just last week, I bought all-day passes to a local fun center for half price. 14. Swap services. This is probably my favorite item on the list. I adore swapping services. For example, I have a friend who is an amazing photographer. She's providing photography services (including a few photos on this post) in exchange for my watching her kids for a few days. Think of what you can provide and reach out. Trade babysitting, photography, music lessons, sewing skills, yard work, house cleaning, tutoring, organizing, decorating, entertainment, artwork, and so much more. 15. Take advantage of community programs. My oldest son is taking Taekwondo lessons through a continuing education program our school district offers. It's a fraction of the cost of a traditional dojo and we're quite pleased with the quality. Our community center offers step aerobics and a sculpt and tone class for just $9/month and they allow me to bring my kids at no additional cost. Ask around and see what's available in your area. Savvy spending doesn't end with these fifteen items. Once you get in the habit of searching for the biggest bang for your buck, you'll find opportunities everywhere you look. Or put it into savings for dream chasing and all that. You know, cuz that's important, too...I guess.